With just five minutes of hands-on time, these garlicky mashed potatoes may just be the easiest you’ve ever made. Yes, I have a calendar. Yes, I know I missed the boat on this one. 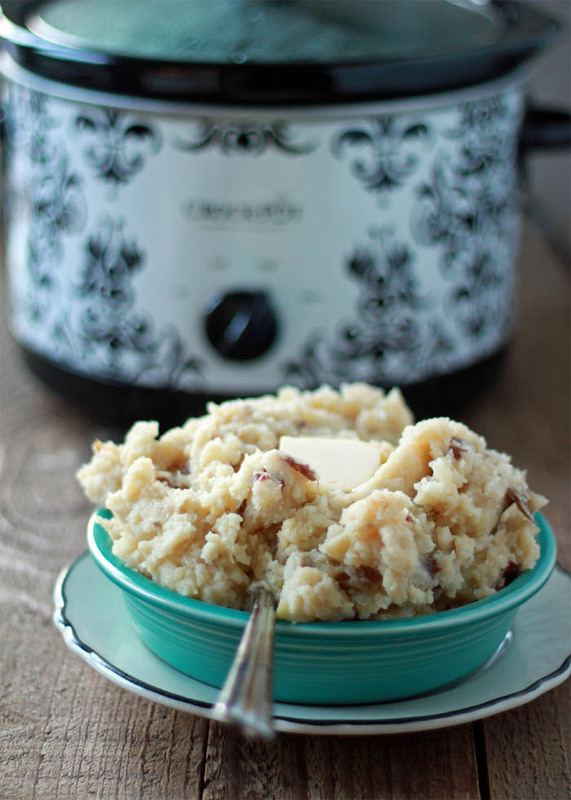 Yes, I totally realized I should have posted this Crock Pot mashed potato recipe before Thanksgiving. Grr. Buuuut I didn’t. And I don’t want to wait another year to share. Besides, mashed potatoes are delicious any time of year, right? Especially super garlicky, buttery, creamy, and ridiculously easy ones. Right?! 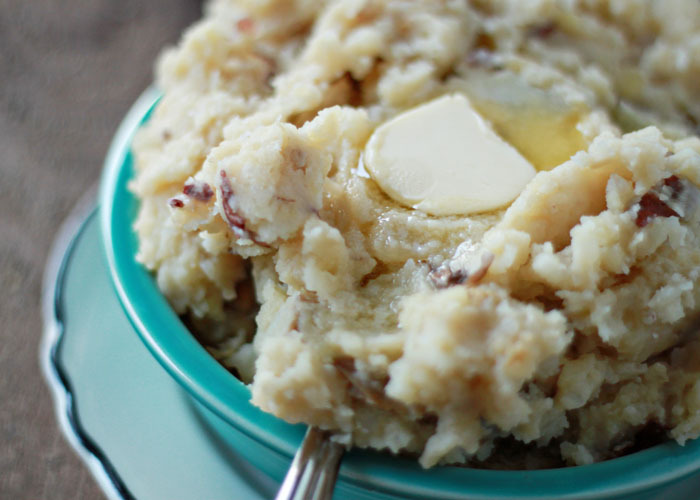 These mashed potatoes take, oh, about 5 minutes of hands-on time. Wash your potatoes. Put them in the Crock Pot with whole peeled garlic cloves, a little broth, some butter. Turn on the Crock Pot. Come back a few hours later, and mash. Add a little half and half. Season with salt and pepper. Mash a little more. I love, love, love this recipe. I mean, I always love Crock Pot recipes, but this one kind of takes the cake. No peeling potatoes over the sink. No pots of water boiling over. No mincing garlic, even! Just throw, cook, mash. Truthfully, they’re not going to be the fluffiest mashed potatoes you’ve ever eaten – they’re just not that type of mashed potato. But what they lack in smooth, silky puffiness, they more than make up for in incredible, mellow slow-roasted garlic flavor. Try this for the holiday, or any day. Or, okay fine, just go ahead and bookmark for next November. It’s all good. Place garlic in the Crock Pot, then add potatoes. Top with butter, sprinkle on the salt, and add the water or vegetable broth. Cook on high 3 – 4 hours or low 8 hours. Potatoes and garlic should be very tender. 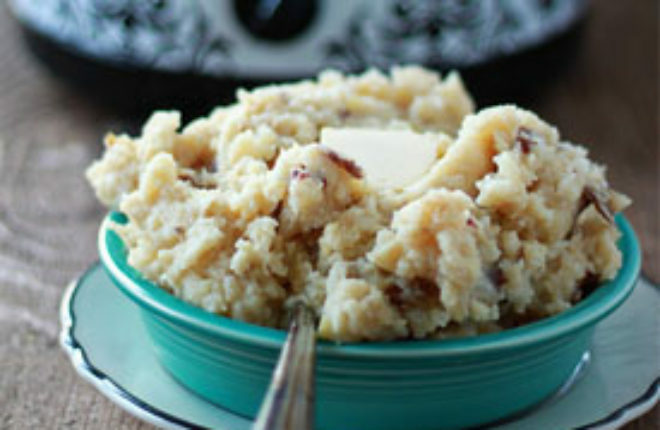 Using a potato masher, mash potatoes a bit and then pour in 1/4 cup half-and-half. Continue mashing, adding additional half-and-half until potatoes are desired consistency. Taste and add additional salt and pepper if desired. Serve topped with additional butter if desired. The first time you make this recipe, you may want to make sure it’s a day when you’re home and can check on the potatoes every now and then. Even though Crock Pots retain moisture and recipes like this with very little moisture added tend to work out fine, slow cookers can vary. So keep an eye on it to make sure the liquid doesn’t completely evaporate while cooking. My favorite winter comfort food right here! I need to dust of my crock pot and make these stat! YAY! This is going to get a test run this week for sure! We call our crock pot Alice because, like the maid on the Brady Bunch, “she” does the cooking for us. So “Alice” will be busy all day one day this week! Just wanted to say that some bulk stores sell a vegetarian “chicken” broth that really works well in these types of recipes. I find vegetarian broth too cabbage-based sometimes and that it can really alter the taste of the food. If you can find the veggie “chicken” one, give it a try! Just curious what you would serve these with? I just went vegetarian and usually when I think of mashed potatoes, I think of some kind of meat with them. Love your blog by the way, my boyfriend is still a meat eater so it’s been a great help! Hi Daniela, that is such a good question! We’re used to serving mashed potatoes with a protein, and in vegetarian cooking, it can be hard to find a mostly-protein main. For vegetarians, mashed potatoes are great served alongside lentil dishes (like dal, lentil-stuffed cabbage rolls, or veggie loaf). Quinoa-stuffed peppers would also be a great option. Or how about topping some with Field Roast for an alternative to bangers and mash? That should work – the end result might not be quite as creamy but it should still be good! 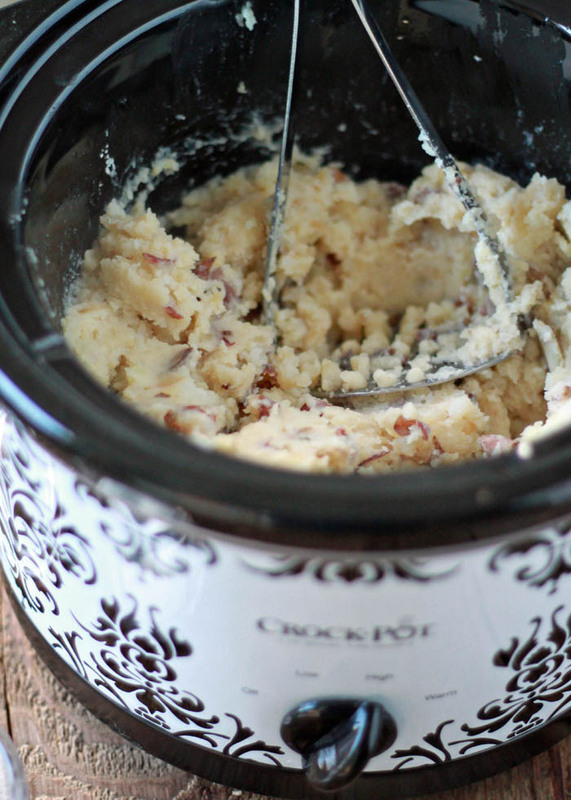 My sister raves about crock pot potatoes but I’ve never tried them before. Thanks to this I’ve got them chopped and in the pot ready to cook while I’m at work. 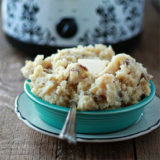 And I’m totally with you: mashed potatoes are an all year food! These look delicious! Could I use regular russet potatoes instead of red potatoes? Hi Lindsay, yes, russet should work just fine! 🙂 I would just suggest peeling them first. 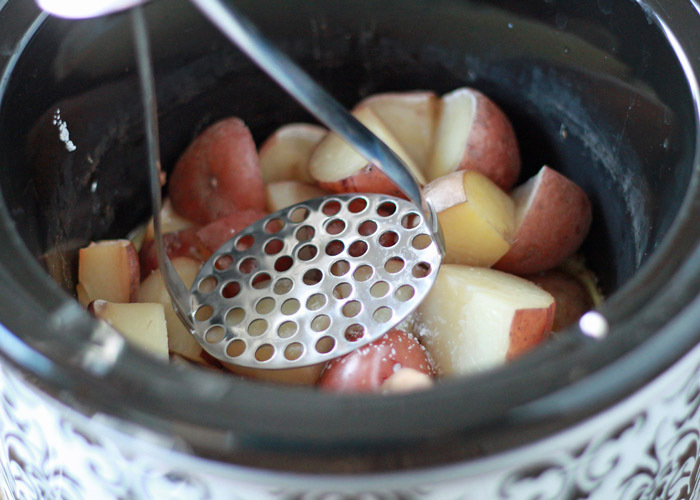 Have you tried this with Yukon gold potatoes? I have a bag from this weeks grocery trip? Hi Danita, I haven’t tried this particular recipe with them, but I love using Yukon golds for Crock Pot mashed potatoes in general. I think they would be great in place of the red. I can’t eat dairy…would almond milk work ? Probably (unsweetened of course!). I haven’t tried it myself, though. I’m sure they won’t be quite as rich. If you try it please come back and let us know how it goes! Hi. Have you tried doubling the recipe? I have not, but as long as you have a big enough Crock Pot, I’m sure it will work just fine! I usually use sour cream instead of half & half or milk. do you think it would still work in the crock pot or should I adjust the amount of broth I use? I think it should still work; this is a pretty forgiving recipe. If you do need to thin it some, you could always add another splash of broth at the end.